By registering for the purchase of first batch Polywarmtone FB warmtone paper (glossy or matte), you can participate in bringing the paper back to life. Please fill in all mandatory fields marked with an asterisk (*) otherwise your registration will not be sent. Only if we receive enough pre-orders we can bear the risk of bringing the paper back. At this point we care about sqm of coated material only. The sizes are just an illustration. You can always make changes in sizes and surface later on. We cannot guarantee that the project will not fail, but we aren't asking for pre-payment. Neither do we plan to send you paper which is not identical* to Polywarmtone. If we can't reproduce the paper, you don't owe us a cent. We only ask you to commit to purchasing a quantity of paper which you can comfortably use. With these commitments from our customers, we can procede with an attempt at the production. As soon as the paper is ready to ship, we will contact you and send a sales invoice based on your commitment. *"Identical" means identical in emuslion and photographic properties. We cannot coat on the old "muzeum" base anymore, because this base has been discontinued by the paper manufacturer. 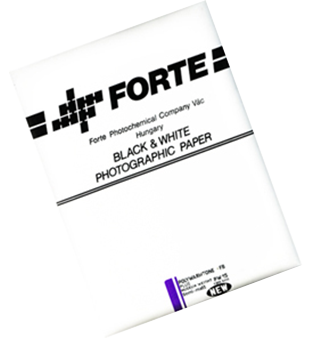 Nor can we use the same paper base that Forte used for their last batches, because this has been discontinued in the meantime as well. All fibre based photopapers produced from the end of this year on, will be coated on one identical base. We do not expect noticeable differences from this base change.